His ever-popular “Colour of the Day”, fashion reports, flawless entertainment news and celebrity gossip (which Gary calls “Da Tea”) are can’t-miss features for Rickey Smiley Show listeners and Dish Nation viewers. At every radio appearance and community event, listeners flocked to his live remotes to see for themselves just who was pouring “The Tea”, and serving up the celebrity dish! 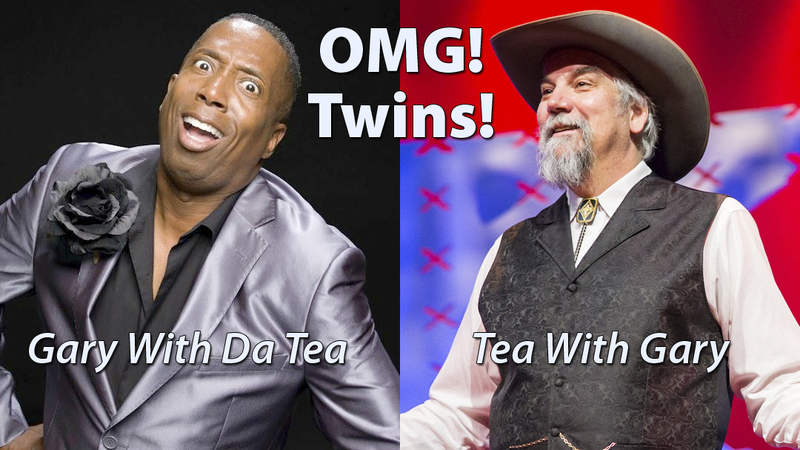 It wasn’t long before he was asked to join The Rickey Smiley Morning Show team, where “Da Tea” is now poured daily. Brimming with curiosity, I searched for pictures of Da Tea Man. Holy cow! We’re virtually twins. All I have to do is shave my beard, buzz my hair, and acquire a shiny suit and you’d have trouble telling us apart. I’m telling you, next time I’m in Dallas, I have to get my picture with him. Wait a minute. He is the one in Dallas, and I am the one with the cowboy hat? Hmmm again. Since I’m sure a daily radio show doesn’t take much time at all (trust me, I used to do a 2-minute weekly live promotional segment on KMXE in Red Lodge, MT, so I’m clearly an expert), I’m going to check in with him. Maybe we can write guest posts for each other’s blogs. You know how I’ve been adding that little paragraph at the end of my blog posts that tells you what tea I was drinking while I wrote it? As you might have guessed, I’m not drinking tea at the moment. I’m having a glass of red wine. That must mean Gary Hayes is the one having tea at the moment. Darjeeling, perhaps? Yeah, he looks like a Darjeeling kind of guy. Posted on 6 March 2015, in Tea Thoughts and tagged Gary Hayes, Gary WIth Da Tea. Bookmark the permalink. Leave a comment.